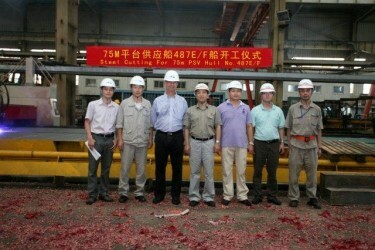 A steel cutting ceremony was held for Sentinel Marine’s first two new build PSVs, with the event witnessed by Mark Grosse, Sentinel Marine’s Managing Director. The red ‘litter’ on the ground are remains of the fire crackers that declared the commencement of the steel cutting. The two PSVs, DARING SENTINEL and EPIC SENTINEL, are scheduled for delivery in Q2 2013.